Suspension & SteeringThere are 14 products. Uprated rear Toe-Link kit with double-shear brackets for Elise S1 with Alloy Uprights. Designed to withstand the stresses of track days and softer-compound tyres. Direct replacement rack that is 2.4 turns lock to lock as (std rack is 2.8 turns). Fitment: All cars. Uprated and maintenance-free long-life Anti-Roll Bar (ARB) Drop Links for all Elise, Exige 340R and 2-Eleven. Championship winning sports/racing suspension kit with adjustable damping from class-leading JRZ Suspension Engineering. Suitable for all models of Elise, Exige, 2-Eleven and 340R. Uprated rear Toe-Link kit for Elise S1 and Elise S2 (K-Series). Designed to withstand the stresses of track days and softer-compound tyres. Excellent value race-specification 2-way adjustable spring and damper kit from class leading suspension engineers JRZ. Suitable for all models of Elise, Exige and 340R. Nitron NTR 40 Fast Road or Track Day suspension kit - Fitment: Elise S1 - Exige S1 - Elise S2 - 340R Please advise Fast Road or Track Day when ordering. Designed to reduce body roll when cornering. Fitment: All cars. Road, Track and Race proven! As fitted to our race-winning Elise S1 and 111R's. Pair of replacement front anti-roll bar bushes. Fitment: All Elise/Exige variants excluding cars with Motorsport nylon bushes. Triple-adjustable racing spring and damper kit from class-leading suspension engineers JRZ. 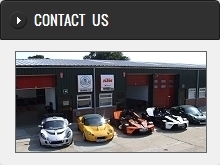 Direct fitments are available for all Elise, Exige, 340R and 2-Eleven. Double-adjustable sports/racing spring and damper kit from class leading suspension engineers JRZ.